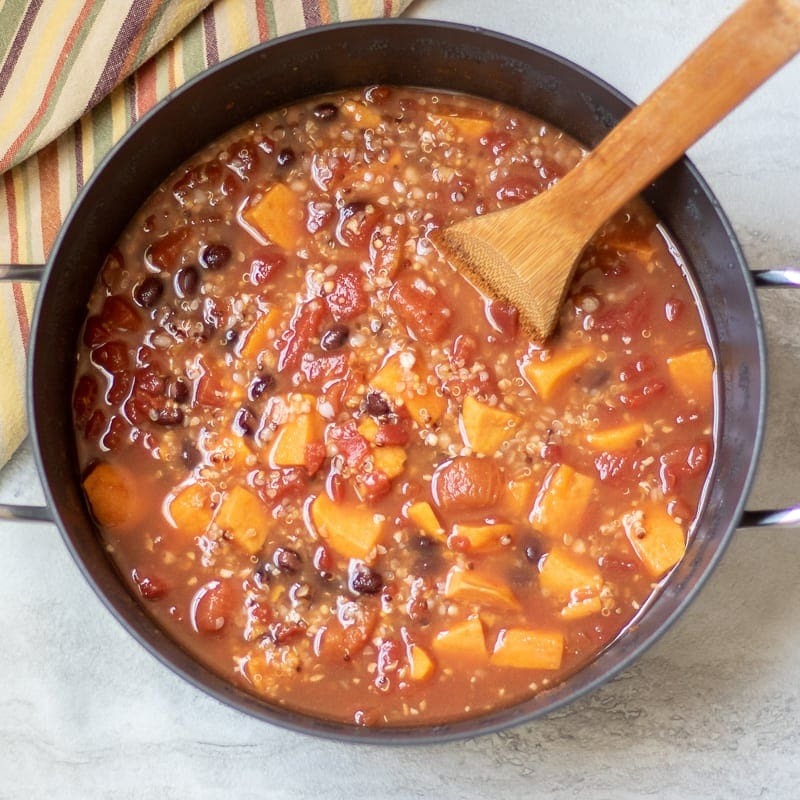 Sweet Potato Black Bean Chili: This vegetarian chili is made with chunks of sweet potatoes, black beans, and quinoa for a hearty, protein-rich, vegan chili recipe. This Sweet Potato Chili is one of my go-to, must make recipes. This Vegetarian Chili is incredibly hearty and filling, and full of southwestern flavors, and sweet potatoes and black beans together are a match made in heaven. 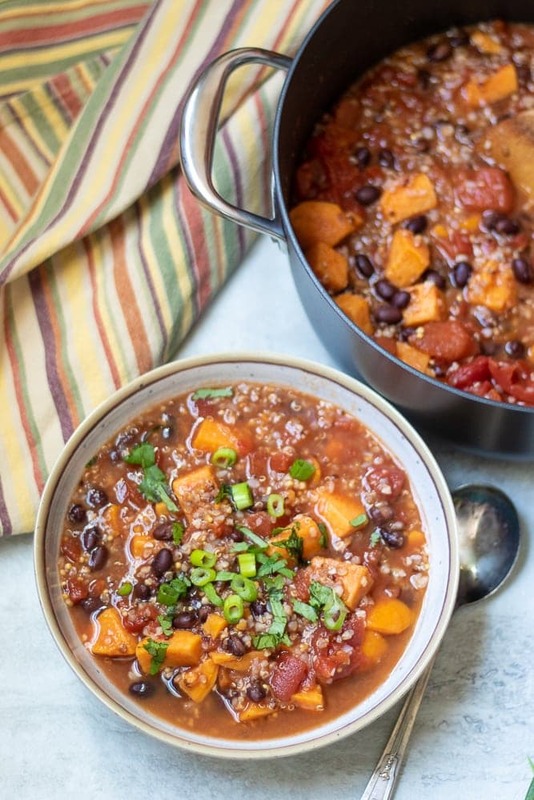 This Sweet Potato Black Bean Quinoa Chili is the remedy for a blustery day. It is the remedy for a long day. It is the remedy for a bad day. Ready in 30 minutes and costing only pennies per serving to make, this budget friendly vegan chili recipe is one also full of protein and fiber. Too bad it doesn’t solve the issue of world peace. Sigh. I can’t win them all. But I will be honest, this Sweet Potato Chili DOES gives me peace of mind. It is a healthy, delicious dinner that fills the family up and leaves smiles on their faces with little effort. So let’s get to business. Heat one tablespoon oil in a dutch oven or heavy bottomed skillet, over medium heat. Add in one small chopped onion and 3 cloves minced garlic. Saute for 3-5 minutes or until onions are just beginning to soften. Add in vegetable or chicken stock, beans, quinoa, seasonings and diced tomatoes to dutch oven. Reduce heat and let simmer for 25 minutes or until sweet potato is tender. This Vegan chili is delicious served plain or take it really make this over the top by topping with diced avocado, corn chips, and/or chopped cilantro. If you are not vegan, top Sweet Potato Chili with shredded cheese and/0r sour cream. Saute onion and garlic in 1 tablespoon oil in small non-stick skillet for 3-5 minutes. Add onion and garlic mixture to slow cooker. Add remaining ingredients to crock-pot and mix well. Set for 8 hours on low or 5-6 hours on high. Freezing Sweet Potato Black Bean Chili. Don’t like garlic? Just omit it from this Chili recipe, or use garlic powder for a milder taste. If you don’t want to mess with chopping an onion, use 2 teaspoons onion powder instead of fresh onion. Instead of canned beans, you can use cooked dried beans for this Black Bean Chili Recipe. You can also use pinto beans in place of black beans if desired. I have used white quinoa, tri-color quinoa, and red quinoa with success in this Quinoa Chili. If you or your family has texture issues with diced tomatoes, blend the tomatoes before adding to the chili. You can also use a 28 ounce can of crushed tomatoes in place of diced tomatoes. 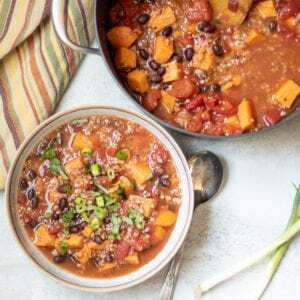 Easy, hearty vegetarian chili recipe made with quinoa, black beans, and sweet potatoes. Heat oil over medium heat in large stock pan or dutch oven. Saute onion and garlic for 3- 5 minutes, or until translucent. Add remaining ingredients into pan and bring to a boil. Reduce heat and simmer for 25-30 minutes, or until sweet potatoes are tender. Top with any desired toppings. Delicious, love the super cute bowl too. I have to try this! What a yummy sounding flavor combination! I am sooo into sweet potatoes and black beans right now! Mmmm! Chanelle, I could totally live on black beans and sweet potatoes! I love the combo so much! I’ve made Quinoa chili before, but not with Sweet Potato. I’m going to have to try that! Pinning, thanks! Thanks Celeste. I hope you enjoy it. 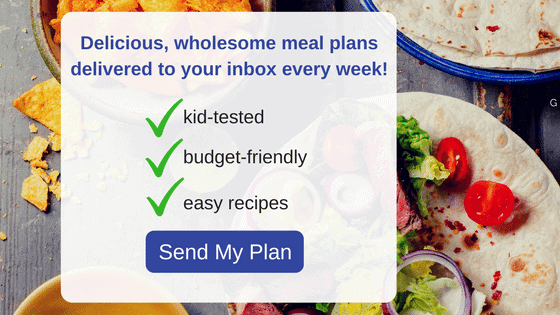 Nicole–this is my absolute favorite way to enjoy quinoa! Plus, it could not be easier!!! Black beans are one of my husband’s favorite foods! He also likes sweet potatoes, and I’ve been trying to convince him to give quinoa a go. Maybe this will finally do it! BTW, his solution to watery onion eyes is to wear a snorkel mask. It looks ridiculous, but he insists on cutting onions ever since I accidentally cut myself while cooking earlier this year and ended up with stitches. Visiting from The Pin Junkie! Natasha, This is my absolute favorite way to eat quinoa. Maybe cut the quinoa to 1/2 cup the first time you make this for your husband and add more beans or potatoes–ease him into it 🙂 Add some corn chips and cheese and he should be golden! YUM! This looks delicious! I’ll pin this puppy and try it out this week. Let me know how you like it Anita!! And this is so yummy!! 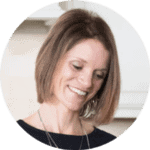 Be on the lookout, I am sharing my tips on how to survive the holidays while being gluten free! Let’s bring this one to the UN! You’ll never know if you don’t try:p I have been dying to use sweet potato in a chili. This sounds delish! Thanks for linking up last week at Foodie Fridays! this sounds delicious! I’m putting it on my meal plan! Awesome Brittany. Let me know how you like it. One pot meal! Love it! You will love it. I wish I had a bowl myself today! Sweet potato and black bean chili is one of our family favorites. The kids love it. This recipe takes it up a notch with the chips! Will definitely give this a try. Thanks for linking up! Thanks Rachel. My kids love it as well! I almost made something really similar to this for today instead of the stuffed sweet potato! 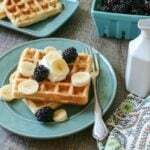 Awesome recipe, looks so yummy! I’m trying to become a healthier cook after years of being on the convenience foods merry-go-round. While I’ll never get my husband to eat dishes such as this one, I made a pot for myself to take for lunches this week. I followed the recipe to a T; however, the finished product is very thick…not very much liquid remaining at all. It seems like the quinoa soaked most of the liquid up. Also, do you have nutritional info? Your thoughts? This is a very thick chili, but based on the amount of liquid your onions gave off and how old the quinoa is, it may absorb more liquid. I personally like a thick chili and as it sits, I add a bit of water with a dash of salt before heating and eating to thin it out (it will soak up more liquid the longer it sits, just as all grain dishes.) However, in the future, if you prefer a thinner consistency, cut the quinoa down by half. The chili is about 300 calories, 4 gms fat, 15 gms protein, and 10 grams of fiber per 1/6th of a serving. Hope that helps! Feel free to ask any more questions you have! This may be a silly question – do you cook the quinoa first, or add it in un-cooked? Thanks! Made this according to the recipe and it turned out great! I have a bag of black beans… should i cook them 1st and then add them to this? I saw in another recipe where black beans would cook from dry beans to ready to eat in 3-4 hours… so couldn’t I do that here? Love this idea! I wonder if you could replace the sweet potato with butternut squash. I have lots of that from the garden. I made a meatless chili with lentils that turned out amazing, can’t wait to try this one! I have a friend who struggles with vegetarian recipes to make for her stepdad when they do family dinners, so I am definitely going to send her your way because this recipe looks spectacular! This was my first experience with sweet potato chili and I was NOT disappointed. Filling and full of flavor! YAY!!! SO glad you enjoyed Jessica–it is one of my favorites!